The Enterprise agrees to transport Riva, a famous mediator who happens to be deaf, to a bloody warzone. 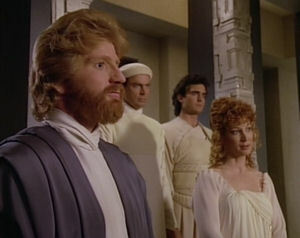 Once there, Riva's translators are killed and it is up to Counselor Troi to convince Riva to keep mediating. I want to know more about "the leaders of Fendaus V, who were without limbs." The implication is that this was a genetic thing, which makes whatever species lives on Fendaus V a little extra interesting. I wonder if the libido guy sticks around... No, I won't finish that thought. I'm sure everybody who watches this episode thinks about it. Riva's alien sign language looks an awful lot like American Sign Language. Researching this episode online, I've discovered that the actor who plays Riva, Howie Seago, is actually deaf. It's no big deal, really, but wouldn't it be more authentic for his sign language to be different? I guess you don't see aliens on the show using their alien language very often (though you do see it occasionally), so yeah, there's no big nitpick here. Riva has three different people for his three different emotional stances, but the dialogue doesn't seem to match up with the appropriate person every time. Mostly, it just seems to me like the woman--the advocate for balance and reason--should be talking a lot more. Why does Data translate what people other than Riva are saying? He knows that Riva is perfectly capable of reading lips. Also, Data doesn't seem to translate everything being said, which is doubly odd. Does anybody consider the possibility that Riva just wants to commit suicide? Yeah, let's just leave him on the violent, warring planet, right in the middle of the battlefield, even though he's seriously depressed about losing his three lifelong friends and translators, and then never bother to check on him again. The scholar/artist member of Riva's chorus is played by Randy Oglesby, who will go on to play six more characters in Trek, including the recurring role of the Xindi Degra in ENT. It's so strange that O'Brien has been on the show since the pilot episode (though he's only appeared in a handful of episodes since), but at this point, he still doesn't have a name or consistent rank. In the previous episode, "The Outrageous Okona," we saw Teri Hatcher as the transporter chief, and yet O'Brien has appeared more than once this season in the same role, albeit without a name. It reminds me of the Chief Engineer nonsense from the first season, before the show settled on La Forge as the sole chief. At what point, I wonder, does O'Brien go from being a background no name to an actual character?